Similar to the standard Maxi Belt, but with several extra features. 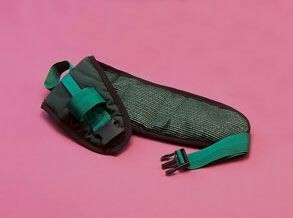 The soft, padded belt has a non-slip inner lining to help prevent the belt sliding upwards or sideways during transfer. The handholds are both angled and lateral to ensure that the carer can obtain a good secure grip. Machine wash up to 71°C. Suitable for waist sizes 610 to 1143mm (24 to 45").